The Tate Modern, on the banks of the river Thames in London is already an iconic building. Making use of a decommissioned powerstation, Tate has managed to both embrace contemporary culture and artistic practice in its role as a museum, gallery and events space, as well as holding onto the history and heritage of its home. 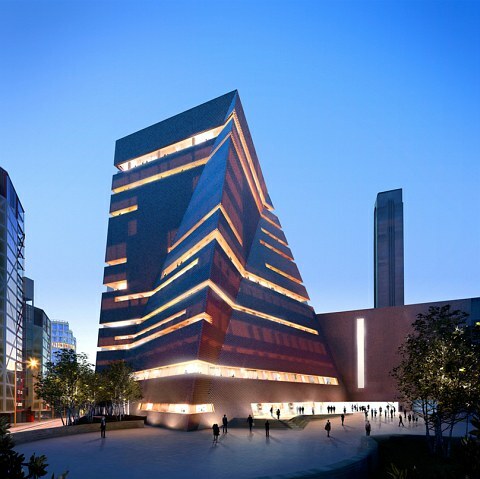 Currently underway is the building of a brand new branch of the Tate Modern. Sitting to the South of the existing building, the new addition to the Tate was designed by Herzog and de Meuron and will stand at 64.5 metres above ground, with 11 levels of space for the Tate's curators to play with. The most recent post on the Tate Blog gives us a bit of an insight into the building works and what is going on as part of the project. Under the ground where the new building is to be situated are the large oil tanks that used to hold millions of gallons of oil for the power station. These 8 metre high constructions have been at the root of some debate recently in regards to whether the Tate should keep them or flatten the lot to give the new building a fresh start. Thankfully the decision was taken to include them in the architecture and retain them as creative spaces for the new building. After all, the Turbine Hall in the main part of Tate Modern is one if its most recognised features, and remains as a lasting part of the original internal architecture of the building. At this point in the process, the oil tanks have been unearthed and are undergoing the necessary rennovations to make them fit to be part of the new construction. Around the tanks there is also the delicate task of creating the foundations for the building. With massive funding cuts upon us, and with the fact that it isn't every day that a country's major museum pulls together an entirely new branch into which is can extend its collection and develop its role in the artistic community, offering spaces for education and areas for socialising, its great to be able to follow the development of the new Tate building. Visit the Tate Blog to find out more about the new buliding and get the inside scoop on new exhibitions and events. The image of the new Tate building is courtesy of Hayes Davidson and Herzog & de Meuron.